Cephalonia or Kefalonia (Greek: Κεφαλονιά or Κεφαλλονιά), formerly also known as Kefallinia or Kephallenia (Κεφαλληνία), is the largest of the Ionian Islands in western Greece. It is also a separate regional unit of the Ionian Islands region, and the only municipality of the regional unit. It was also a former Latin Catholic diocese Kefalonia–Zakynthos (Cefalonia–Zante) and short-lived titular see as just Kefalonia. An aition explaining the name of Cephallenia and reinforcing its cultural connections with Athens associates the island with the mythological figure of Cephalus, who helped Amphitryon of Mycenae in a war against the Taphians and Teleboans. He was rewarded with the island of Same, which thereafter came to be known as Cephallenia. Cephalonia has also been suggested as the Homeric Ithaca, the home of Odysseus, rather than the smaller island bearing this name today. Robert Bittlestone, in his book Odysseus Unbound, has suggested that Paliki, now a peninsula of Cephalonia, was a separate island during the late Bronze Age, and it may be this which Homer was referring to when he described Ithaca. A project which started in the Summer of 2007 and lasted three years has examined this possibility. Cephalonia is also referenced in relation to the goddess Britomartis, as the location where she is said to have 'received divine honours from the inhabitants under the name of Laphria'. In the southwestern portion of the island, in the area of Leivatho, an ongoing archaeological field survey by the Irish Institute at Athens has discovered dozens of sites, with dates ranging from the Palaeolithic to the Venetian period. From an archaeological point of view, Cephalonia is an extremely interesting island. Archaeological finds go back to 40,000 BP. Without doubt, the most important era for the island is the Mycenaean era, from approximately 1500–1100 B.C. The archaeological museum in Cephalonia’s capital, Argostoli – although small – is regarded as the most important museum in Greece for its exhibits from this era. The most important archaeological discovery in Cephalonia (and indeed in Greece) of the past twenty years is that, in 1991, of the Mycenaean tholos tomb at the outskirts of Tzanata, near Poros in southeastern Cephalonia (Municipality of Elios-Pronni) in a lovely setting of olive trees, cypresses and oaks. The tomb was erected around 1300 B.C; kings and highly ranked officials were buried in such tombs during the Mycenaean period. It constitutes the largest tholos tomb yet found in northwestern Greece and was excavated by archaeologist Lazaros Kolonas. The size of the tomb, the nature of the burial offerings found there, and its well-chosen position point to the existence of an important Mycenaean town in the vicinity. In late 2006, a Roman grave complex was uncovered as the foundation of a new hotel was being excavated in Fiskardo. The remains date to the period between the 2nd century BC and the 4th century AD. Archaeologists described it as the most important find of its kind in the Ionian Islands. Inside the complex, five burial sites were found, including a large vaulted tomb and a stone coffin, along with gold earrings and rings, gold leaves that may have been attached to ceremonial clothing, glass and clay pots, bronze artefacts decorated with masks, a bronze lock, and bronze coins. The tomb had escaped the attention of grave robbers and remained undisturbed for thousands of years. In a tribute to Roman craftsmanship, when the tomb was opened, the stone door easily swung on its stone hinges. Very near to the tomb, a Roman theatre was discovered, so well preserved that the metal joints between the seats were still intact. A dissertation published in 1987 claims that St. Paul, on his way from Palestine to Rome in AD 59, was shipwrecked and confined for three months not on Malta but on Cephalonia. According to Clement of Alexandria, the island had the largest community of Carpocratians, an early Gnostic Christian sect, because Carpocrates lived on the island. During the Middle Ages, the island was the center of the Byzantine theme of Cephallenia. After 1185 it became part of the County palatine of Kephalonia and Zakynthos under the Kingdom of Sicily until its last Count Leonardo III Tocco was defeated and the island conquered by the Ottomans in 1479. The Turkish rule lasted only until 1500, when Cephalonia was captured by a Spanish-Venetian army, a rare Venetian success in the Second Ottoman–Venetian War. From then on Cephalonia and Ithaca remained part of the Stato da Mar of the Venetian Republic until its very end, following the fate of the Ionian islands, completed by the capture of Lefkas from the Turks in 1684. The Treaty of Campoformio dismantling the Venetian Republic awarded the Ionian Islands to France, a French expeditionary force with boats captured in Venice taking control of the islands in June 1797. Because of the liberal situation on the island, the Venetian govenor Marc'Antonio Giustiniani (1516 – 1571) printed Hebrew books and exported them to the whole eastern mediterranean. In 1596 the Venetians built the Assos Castle, one of Cephalonia's main tourist attractions today. From the 16th to the 18th centuries, the island was one of the largest exporters of currants in the world with Zakynthos, and owned a large shipping fleet, even commissioning ships from the Danzig shipyard. Its towns and villages were mostly built high on hilltops, to prevent attacks from raiding parties of pirates that sailed the Ionian Sea during the 1820s. Venice was conquered by France in 1797 and Cephalonia, along with the other Ionian Islands, became part of the French départment of Ithaque. In the following year the French were forced to yield the Ionian Islands to a combined Russian and Turkish fleet. From 1799 to 1807, Cephalonia was part of the Septinsular Republic, nominally under the sovereignty of the Ottoman Empire, but protected by Russia. By the Tilsit Treaty in 1807, the Ionian Islands were ceded back to France, which remained in control until 1809. Then Great Britain mounted a blockade on the Ionian Islands as part of the war against Napoleon, and in September of that year they hoisted the British flag above the castle of Zakynthos. Cephalonia and Ithaca soon surrendered, and the British installed provisional governments. The treaty of Paris in 1815 recognised the United States of the Ionian Islands and decreed that it become a British protectorate. Colonel Charles Philippe de Bosset became provisional governor between 1810 and 1814. During this period he was credited with achieving many public works, including the Drapano Bridge. A few years later resistance groups started to form. Although their energy in the early years was directed to supporting the Greeks in the revolution against the Turks, it soon started to turn towards the British. By 1848 the resistance movement was gaining strength and there were skirmishes with the British Army in Argostoli and Lixouri, which led to some relaxation in the laws and to freedom of the press. Union with Greece was now a declared aim, and by 1850, a growing restlessness resulted in even more skirmishes. Cephalonia, along with the other islands, were transferred to Greece in 1864 as a gesture of goodwill when the British-backed Prince William of Denmark became King George the First of the Hellenes. In 1864, Cephalonia, together with all the other Ionian Islands, became a full member of the Greek state. In World War II, the island was occupied by Axis powers. Until late 1943, the occupying force was predominantly Italian - the 33rd Infantry Division Acqui plus Navy personnel totalled 12,000 men - but about 2,000 troops from Germany were also present. The island was largely spared the fighting, until the armistice with Italy concluded by the Allies in September 1943. Confusion followed on the island, as the Italians were hoping to return home, but German forces did not want the Italians' munitions to be used eventually against them; Italian forces were hesitant to turn over weapons for the same reason. As German reinforcements headed to the island the Italians dug in and, eventually, after a referendum among the soldiers as to surrender or battle, they fought against the new German invasion. The fighting came to a head at the siege of Argostoli, where the Italians held out. Ultimately the Germans prevailed, taking full control of the island. Approximately five thousand of the nine thousand surviving Italian soldiers were executed in reprisal by the German forces. The book Captain Corelli's Mandolin (which was later made into a film of the same name), is based on this story. While the war ended in central Europe in 1945, Cephalonia remained in a state of conflict due to the Greek Civil War. Peace returned to Greece and the island in 1949. Cephalonia lies just to the east of a major tectonic fault, where the European plate meets the Aegean plate at a slip boundary. This is similar to the more famous San Andreas Fault. There are regular earthquakes along this fault. A series of four earthquakes hit the island in August 1953, and caused major destruction, with virtually every house on the island destroyed. The third and most destructive of the quakes took place on August 12, 1953 at 09:24 UTC (11:24 local time), with a magnitude of 7.3 on the Richter magnitude scale. Its epicentre was directly below the southern tip of Cephalonia, and caused the entire island to be raised 60 cm (24 in) higher, where it remains, with evidence in water marks on rocks around the coastline. The 1953 Ionian earthquake disaster caused huge destruction, with only regions in the north escaping the heaviest tremors and houses there remaining intact. Damage was estimated to run into tens of millions of dollars, equivalent to billions of drachmas, but the real damage to the economy occurred when residents left the island. The majority of the population left the island soon after, seeking a new life elsewhere. The forest fire of the 1990s caused damage to the island's forests and bushes, especially a small scar north of Troianata, and a large area of damage extending from Kateleios north to west of Tzanata, ruining about 30 square kilometres (12 sq mi) of forest and bushes and resulting in the loss of some properties. The forest fire scar was visible for some years. In mid-November 2003, an earthquake measuring 5.3 on the Richter magnitude scale caused minor damage to business, residential property, and other buildings in and near Argostoli. Damages were in the €1,000,000 range. On the morning of Tuesday, September 20, 2005, an early-morning earthquake shook the south-western part of the island, especially near Lixouri and nearby villages. The earthquake measured 4.9 on the Richter magnitude scale, and its epicentre was located off the island at sea. Service vehicles took care of the area, and no damage was reported. From January 24–26, 2006, a major snowstorm blanketed the entire island, causing extensive blackouts. The island was recently struck yet again by another forest fire in the south of the island, beginning on Wednesday, July 18, 2007 during an unusual heatwave, and spreading slowly. Firefighters along with helicopters and planes battled the blaze for some days and the spectacle frightened residents on that area of the island. In 2011 the eight former municipalities of the island lost their independence to form one united municipality. After losing its role as the capital of the island in the 19th century, Lixouri lost also its role as a seat of a municipality after 500 years. The Technological Educational Institute of the Ionian Islands closed one faculty in Lixouri and one in Argostoli. In the ancient period, the people lived in four cities on the island. Krani, Sami, Pale and Pronni formed a federation called "tetrapolis". The population reached 70,000 in 1896, but declined gradually in the 20th century. The great 1953 Ionian earthquake forced many people to leave the island. Many people who left the island moved to Patras or Athens, or they immigrated to America and Australia, following relatives who had left the island decades before. In the same time, people from poorer areas of Greece such as Epirus and Thrace came to the island. The population has hovered between 35,000 and 42,000 since then; in the 2011 census, it was 35,801. 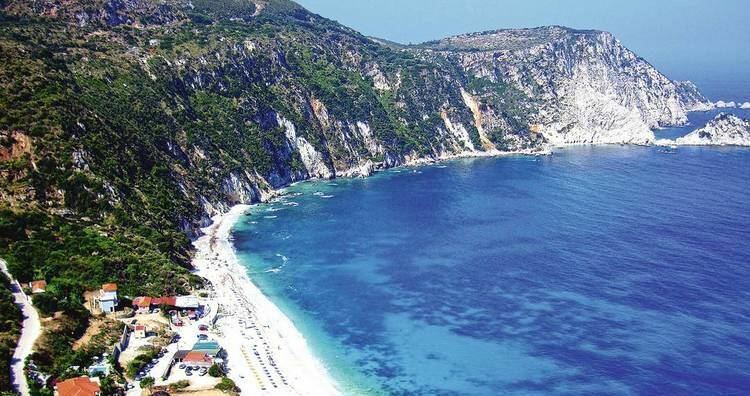 Most of the indigenous people of Cephalonia have surnames ending in "-atos", such as the Georgatos families, and almost every settlement on the island has a name ending in "-ata", such as Metaxata, Chavriata, Frangata, Lourdata, Favata, Delaportata and others. In 1222 the Frankish Crusaders established the Diocese of Kefalonia–Zakynthos (Cefalonia–Zante in Curiate Italian), which survived their rule and even the Turks. On 1919.06.03 the residential see was suppressed but immediately transformed into a Titular bishopric of Kefalonia (Cefalonia in Italian), its territory and title being merged into the Metropolitan Archdiocese of Corfu–Zakynthos–Kefalonia. In 1921 this was also suppressed, never having had an incumbent. The main island of the regional unit is Cephalonia and has a size of 773 km2 (300 mi2), with a population density of 55 people per km2 (140/mi2). The town of Argostoli has one-third of the island's inhabitants. Lixouri is the second major settlement, and the two towns together account for almost two-thirds of the prefecture's population. The other major islands are: Petalas Island, Asteris Island, but they are uninhabited. Cephalonia lies in the heart of an earthquake zone, and dozens of minor, unrecorded tremors occur each year. In 1953, a massive earthquake destroyed almost all of the settlements on the island, leaving only Fiskardo in the north untouched. 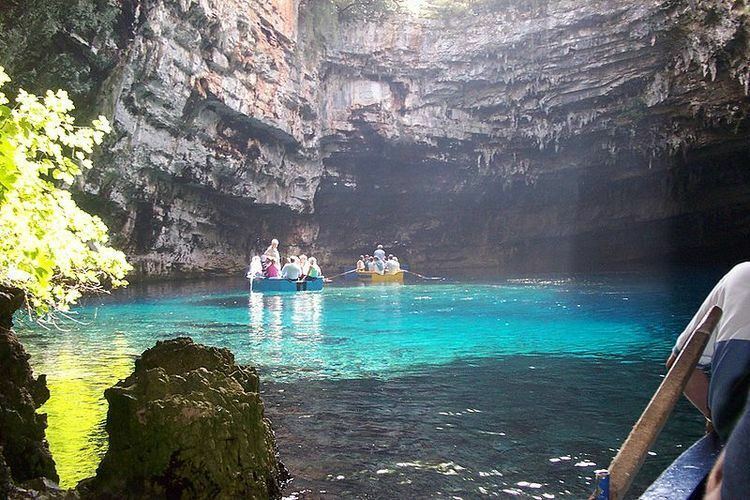 Important natural features include Melissani Lake, the Drogarati caves, and the Koutavos Lagoon in Argostoli. The island has a rich biodiversity, with a substantial number of endemic and rare species. Some areas have been declared a site in the European Union’s Natura 2000 network. The island's highest mountain is Mount Ainos, with an elevation of 1628 meters; to the west-northwest are the Paliki mountains, where Lixouri is found, with other mountains including Geraneia (Gerania) and Agia Dynati. The top of Mount Ainos is covered with fir trees and is a natural park. Forestry is rare on the island; however its timber output is one of the highest in the Ionian islands, although lower than that of Elia in the Peloponnese. Forest fires were common during the 1990s and the early 2000s, and still pose a major threat to the population. Most of the Ainos mountain range is designated as a National Park and is covered with the unique species of Greek fir (Abies Cephalonica) and black pine (Pinus nigra). Cephalonia is well known for its endangered loggerhead turtle population which nest on many beaches along the south coast of the island. A small population of the endangered Mediterranean monk seal, Monachus monachus, also lives around the island's coast, especially on parts of the coast which are inaccessible to humans due to the terrain. Caves on these parts of the coast offer ideal locations for the seals to give birth to their pups and nurse them through the first months of their lives. The European pine marten is known to live on the island. 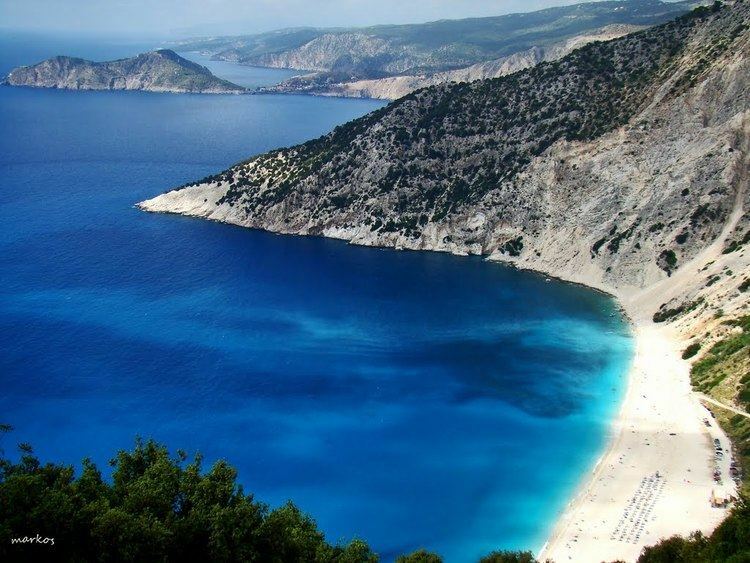 Cephalonia has hot, sunny summers and mild rainy winters. During winter it can occasionally snow in the mountains of the island. It is very wet in the wettest month of December when 115 mm of rain can fall. Conversely, it can be very dry in July when usually there is no or little rainfall. Rain in the summer can usually be seen, but the dry air prevents it from being felt as it is evaporated before it reaches the ground. Wine and raisins are the oldest products exported, being important until the 20th century. Today fish farming and calcium carbonate are most important. The primary agricultural occupations are animal breeding and olive growing, with the remainder largely composed of grain and vegetables. Most vegetable production takes place on the plains, which cover less than 15% of the island, most of which is rugged and mountainous, suitable only for goats. Less than a quarter of the island's land is arable. Until the 1970s, most Cephalonians lived in rural areas, while today, two-thirds of the population lives in urban areas, with the other third in rural towns and villages close to farmland. The island has a long winemaking tradition and is home to the dry, white lemony wines made from the Robola grape. Olive oil production is a major component of Cephalonia's economy. Until the 18th century, the quantity of olive oil produced on the island just covered the needs of the residents. However, the pressure of Venetian conquerors’ for olive plantation, especially after the loss of Peloponnese and Crete, resulted in increasing the production to such a degree that the first exports to Venice began. Before the 1953 Ionian earthquake, there were 200 oil presses operating on the island; today, there are thirteen. There are over one million olive trees on Cephalonia, covering almost 55% of the island's area. Olive oil is very important to the island's local, rural economy. “Koroneiki” and “theiako” are the two main varieties cultivated on the island, followed by a smaller number of “ntopia” and “matolia”. Kefalonian olive oil has a green tone, a rich, greasy touch, and low acidity. Tourism to Cephalonia started in the early 19th century. Even the Royal Family of Greece sent their children in the summer months to Lixouri, in the early 20th century, but the island was not discovered by most tourists until the 1980s. Tourists from all over Greece, Europe and the world visit Cephalonia. It is a popular vacation destination for many Italians, due to its proximity to Italy. As one of the largest islands in Greece, it is well-equipped to handle the influx of tourists during the summertime and it has something to offer to everyone. Two cultural attractions, the picturesque fishing villages of Fiscardo and Assos, and various natural attractions, including Melissani underground lake, Drogarati cave and Myrtos beach, have helped popularize Cephalonia. The film, Captain Corelli's Mandolin (2001), shot on the island itself, made Cephalonia more widely known. Across the broader island, two large monasteries are to be found: the first is that of Haghia Panagia in Markopoulo to the southeast, and the other lies on the road between Argostoli and Michata, on a small plain surrounded by mountains. This second has an avenue of about 200 trees aligned from NW to SE, with a circle in the middle, and is the monastery of Saint Gerasimus of Kefalonia, patron saint of the island, whose relics can be seen and venerated at the old church of the monastery. The monastery of "Sissia" was probably found by Francis of Assisi, it was destroyed in 1953 but the ruins still exist. Although much of the island was destroyed by earthquakes, many notable churches all over the island have survived, some dating back to the renaissance. The ornaments of the churches are influenced by Venetian manierism. The Ionian Islands have a musical tradition called the Ionian School. Lixouri has the Philharmonic Orchestra (since 1836) and Argostoli the Rokos Vergottis Conservatory. Richard Strauss visited Lixouri some times where he had an affair with the pianist Dora Wihan (born Weiss). The novelists Nikos Kavvadias (1910–1975) and the Swiss Georges Haldas (1917–2010) spent parts of their life on the island. Andreas Laskaratos was a satirical poet and wrote about the society in the town of Lixouri. Lord Byron wrote parts of "Prelude" and "Don Juan" in Livatho. Perhaps the best known appearance of Cephalonia in popular culture is in the novel Captain Corelli's Mandolin, by the English author Louis de Bernières. The book is believed to have been inspired by the picturesque village of Farsa, just outside Argostoli. The love story comprising the theme of the book is set before and after the Acqui Division massacre, during the Second World War. A film adaptation was released in 2001. During filming there was lively debate between the production team, local authorities as well as groups of citizens, as to the complex historical details of the island's antifascist resistance. As a result, political references were omitted from the film, and the romantic core of the book was preserved, without entering complex debates about the island's history. In 2005, Riccardo Milani made his TV movie, Cefalonia, also about the massacre, with music by Ennio Morricone. There are five harbours and ports in the prefecture: four main harbours on the island, Same or Sami, and a major port with links to Patras and Ithaca. Poros, in the south, has ferry routes to Kyllini; Argostoli, in the west, is the largest port, for local boats and ferries to Zante and regularly to Lixouri; Fiscardo, in the north, has links to Lefkas and Ithaca. There is room for about 100 small boats in Argostoli, where the port stretches 1 kilometre around the bay, while Lixouri is situated 4 km (2 mi) across the bay from Argostoli, on the Lixouri peninsula. There is a road connection to the rest of the island, but driving from Lixouri to Argostoli involves a 30 km (19 mi) detour. Argostoli-Fiskardo Road (with link to Lixouri). This road is currently closed just north of Myrtos beach, due the January 2014 earthquake. The ferry between Argostoli and Lixouri goes every hour and every half-hour in the season. There are a few bus lines serving the more rural areas of Kefalonia, but often only two times a day. The KTEL bus cooperation offers services from Lixouri, Poros and Argostoli to the mainland. Cephalonia has one airport, Kefalonia Island International Airport, (IATA: EFL, ICAO: LGKF) with a runway around 2.4 km (1.5 mi). in length, located about 10 km (6 mi) south of Argostoli. Almost every scheduled flight is an Olympic Air route, flying mainly to and from Athens, although there is an Ionian Island Hopper service three times a week calling at Cephalonia, Zante and Lefkas. In summer the airport handles a number of charter flights from all over Europe. Epiphanes was born on Cephalonia in the late 1st century or early 2nd century to Carpocrates (his father), and Alexandria of Kephallenia. He is the legendary author of On Righteousness, a notable Gnostic literary work that promotes communist principles. Gaius Antonius Hybrida, the uncle of the famed triumvir Mark Antony and co-consul of Cicero, who was exiled to Cephalonia in 59 BC. Giacomo Pylarini (1659–1718), doctor who gave the first smallpox inoculation outside of Turkey and contributed to the later development of vaccination against smallpox, by Edward Jenner. Andreas Metaxas (Greek: Greek: Ανδρέας Μεταξάς) (1786 - September 19, 1860), prime minister of Greece born on the island of Cephalonia. Spiridonos Louzis (Greek: Greek: Σπυρίδωνος Λούζης) (c. 1741–1815), Greek scholar, diplomat, politician and naturalized ambassador of Prussia. Petros Melissinos Greek: Greek: Πέτρος Μελισσηνός)(c. 1726–1797) was a General of the Army of the Russian Empire and was widely considered the best Russian artilleryman of the 18th century. Panayis Athanase Vagliano, Greek: Greek: Παναγής Βαλλιάνος a.k.a. Panaghis Athanassiou Vallianos, (1814–1902) was a merchant and shipowner, acclaimed as the father of modern Greek shipping. Photinos Panas, (January 30, 1832 – 1903) ophthalmologist, born on the Greek island of Cephalonia, Spartia. In 1860 he obtained his medical degree at Paris. He was the first professor of ophthalmology at the University of Paris, and in 1879 established the ophthalmology clinic at the Hôtel-Dieu de Paris. Ioannis Metaxas (April 12, 1871 – January 29, 1941), General, appointed Prime Minister of Greece between April and August 1936, and dictator during the 4th of August Regime, from 1936 until his death in 1941. Dimitrios Loukatos (1908–2003), folklorist-anthropologist and specialist in Greek folklore. Gerasimos D. Arsenis, (1931– ) politician, former minister of Finance, Defense and Education. Anna Pollatou (1983–2014) a rhythmic gymnast; she won a bronze medal at the 2000 Summer Olympics.